The social network Wednesday said that it would allow advertisers to target users based on their language. So, if you frequently tweet about shoes in Spanish you might see a promoted tweet or promoted account in your feed with a shoe ad in that language. Twitter already provides a host of tools to let advertisers target people by interest, keywords, gender or geography. Language targeting constitutes a further expansion of the company's advertising program globally, allowing Twitter to make more money from its vast user base in other parts of the world besides the U.S. If Twitter wants to stay healthy financially, it needs to target its international users. Seventy-eight percent of the company's monthly active users in the last three months of 2013 were outside of the U.S., but Twitter's international revenue was only 27 percent of its total sales, according to its annual report. Twitter, like Facebook, makes the bulk of its money through advertising. "Language targeting can benefit marketers who want to reach a global audience with language-specific messaging, or who are in countries where large populations speak multiple languages," Twitter said Wednesday in its announcement. Language targeting will be made available to all advertisers globally through the company's Ads API (application programming interface), the company said. Twenty different languages can be targeted, including Spanish and Italian. 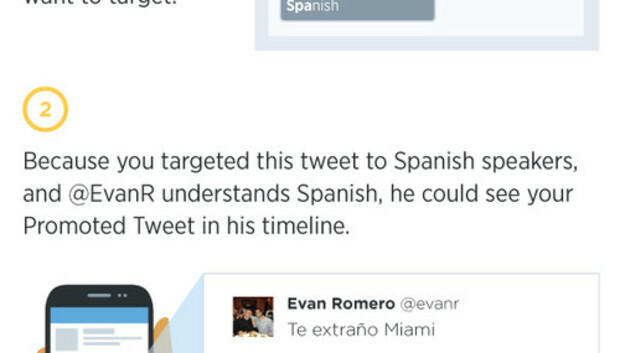 Twitter did not immediately respond to say which other languages were included. Twitter has a number of signals to determine a user's language, including the language selected in profile settings and user activity on the site. Twitter claims to be smart at telling which language a user speaks, so you may not have much luck trying to trick it into not showing you these targeted ads. "A user can be targetable by multiple languages if we infer that a user is multilingual," the company said.